You win some and you lose some . . . or do you? The final AVIVA voting results in our funding category (to $25K). Click image for close-up. On January 19th, I had the extreme honour of accepting the Vancouver Aquarium’s Murray A. Newman Award for Excellence in Aquatic Conservation. In the thick, wonderful soup of positive emotions associated with this, I delight in the award being known as The MAN Award. Yeah, I got a MAN award! (For my acceptance speech, see the link at the bottom of this post). On January 25th, it was announced that the Marine Education and Research Society’s Humpback Comeback Project would not receive funding dollars from the AVIVA Community Fund. (I am a director for MERS and have had the joy of 7 years of volunteer effort in studying local humpbacks.) The competition result was a shock as this small local project succeeded in getting the third highest number of votes out of more than 520 in our category (7,113 votes total, more than 1,100 votes ahead of the forth place). 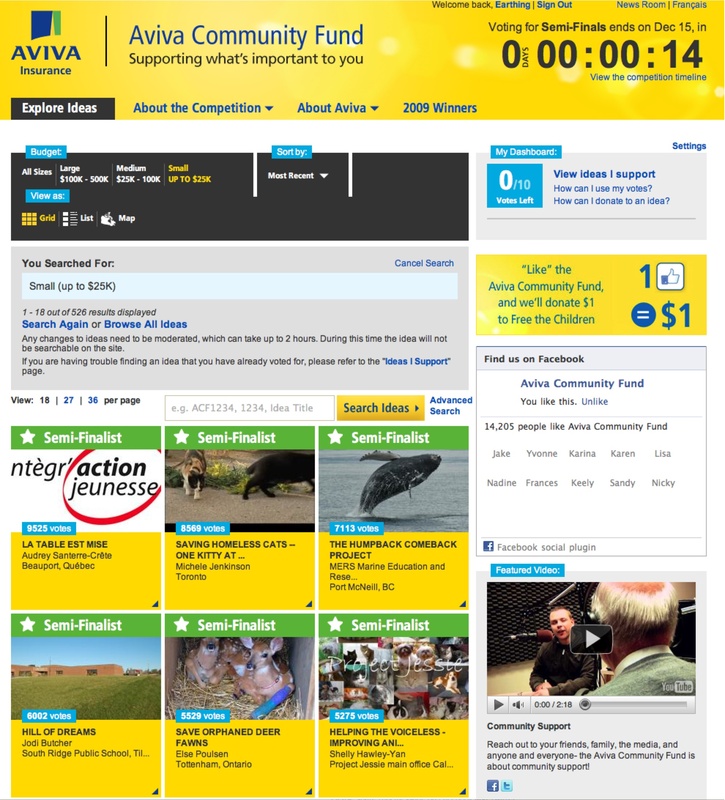 After the intensive on-line voting, the projects were judged and Humpback Comeback was determined not to best meet the AVIVA criteria/priorities. See the winning projects at this link. Observations are that “build ’em” and human-to-human projects such as playgrounds were more successful in meeting the criteria of this generous and PR-savvy insurance company. It was a shock yes, but there are far more similarities between winning the MAN award and the AVIVA result than just my exclaiming “Oh man!” at the end of both. I could not have achieved what was recognized by the award without the opportunities and support provided by the people of Northern Vancouver Island. The astounding community support and encouragement we also received for the Humpback Comeback Project provided an equally potent affirmation of purpose. Losing? Every time someone voted for the Project or that we had a media opportunity, awareness was created for whales and for the threat of entanglement; positive attention was focused on our area and its remarkable biodiversity; and people responded to an opportunity to create positive change. There are those that have now even decided to support the Project through donations or by helping to find alternative funding sources (donations made via www.mersociety.org). Sometimes life deals a challenge that only intensifies focus, strengthens resolve, and enhances creativity to achieve what you believe in. Oh man, I assure you that this is the case with the Humpback Comeback Project! Great thanks to you all for the support. Photo by Vancouver Aquarium's John Healey. The Marine Detective among Drs. 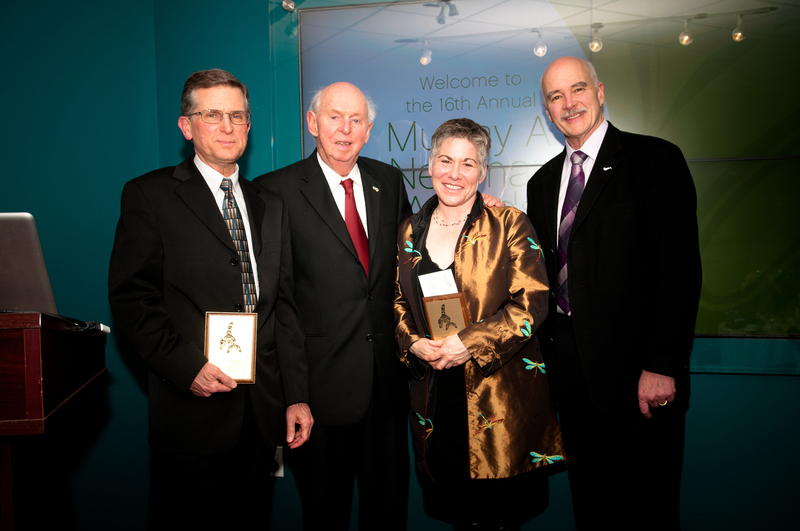 Left to right: Dr. Randall Peterman - winner MAN award for Science; Dr. Murray A. Newman - award is in his honour; founding director of the Vancouver Aquarium; Dr. John Nightengale - President Vancouver Aquarium. For my acceptance speech for the Murray A. Newman award, see this link (15 minutes). It is apparently laughter and tear inducing with the ultimate message being – be relentless in creating positive change. Includes lots of my images of the marine biodiversity of Northern Vancouver Island. See announcement of the award in the North Island Gazette. For previous posts on humpbacks and the Humpback Comeback Project, scroll down at this link. Thank you so much George! I will! Don’t know how to stop. Beste wensen!